You will heard a lot about UKIP's prospects for the assembly elections - how they're expected to get as many as eight AMs and how they've been dogged by infighting. 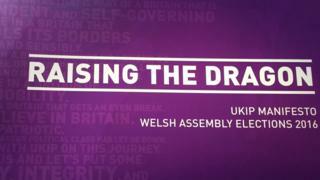 UKIP has traditionally been focused on campaigning to leave the European Union, but on Friday we found out a little more about what they'd actually like to do in the assembly with the publication of their Welsh assembly election manifesto. It is a document that runs to 48 pages - much shorter than both the Plaid Cymru and the Liberal Democrats manifestos. But apart from some ideas that have support across the political spectrum, it's difficult to see how many of UKIP's policies would be implemented unless they somehow find themselves in government. And as things stand, it is highly unlikely Labour, Plaid Cymru or the Lib Dems would work with the party. The common accusation against Assembly members is that they are preoccupied with constitutional matters. UKIP promises to shake-up Cardiff Bay, so it is surprising that the first thing in their manifesto is what they would do about the constitution. Their approach is unorthodox compared to the consensus on Wales' devolution path that is held, by and large, by the rest of the country's parties. UKIP opposes the Wales Bill - which would change how the Assembly works in a bid to make it clearer - because it is "incoherent" and would create "unstoppable pressure for a separate legal jurisdiction". They do not want more Assembly Members. They acknowledge there is insufficient scrutiny in the Welsh Assembly, but they want MPs to assist the body. The argument goes that, as their responsibilities have decreased, the MPs can do this in their free time. Councillors could also be involved in the process. The party also promises to promote devolution to local councils and communities. UKIP's signature health policy is to give voters control over who runs Wales' health boards. The party says this will put patients and their families at the heart of NHS decision making. The new elected health boards would be slimmed down to have no more than 11 people, and would be elected through single transferable vote. The party would also integrate the NHS with adult social care and place the combined service under the remit of elected local health boards. A couple of UKIP's policies suggest reviving ideas from the past. One example is grammar schools, which were abolished in Wales by the 1980s but still exist in England. UKIP says secondary schools should be given the opportunity to develop into grammars or vocational schools, which they say could improve social mobility for able children from poorer backgrounds. Entry to grammars would be based on an exam taken by all pupils in the final year of primary school. It is not called an eleven plus, but it sounds like one. New University Technical Colleges could also provide a "technical education experience," working with employers and a local university with at least 40% of study time dedicated to technical specialisms. Ensure efforts to promote English/Welsh bilingualism are a springboard for learning other languages, not "an alternative"
UKIP also says it would replace the tuition fee grant with loans for Welsh students choosing to study in England. However fees would end for Welsh students that study science, technology, engineering, mathematics and medicine subjects in Wales. It's not devolved, but UKIP says it would abolish the Severn bridge tolls within two years when they pass into public ownership. The party says they'd fund any Welsh Government contribution to the bridges' maintenance by axing the budget for climate change projects. UKIP says it would not support the building of the M4 Relief Road along the lines of the six lane motorway Black Route supported by the Welsh Government. Instead it supports the "Blue Route", which is an upgrade of existing Newport roads. UKIP says there is no such thing as a Wales-wide economy. South and North Wales' economies have closer ties with the adjoining regions of England than each other, the manifesto says. The party says it would strengthen "key economic ties between South Wales, Bristol and the M4 corridor to London", and ensure North Wales is integrated into opportunities flowing from the "Northern Powerhouse" concept. The manifesto says the party would "support joint working between Welsh and English council areas which have close economic links". The budget for economy development would be devolved from Cathays Park to local councils. On housing, UKIP says it would incentivise brownfield development. "Although we are fully aware of the need to build more homes, UKIP will not allow new housing to strip our nation of prime agricultural land," the party says. UKIP question whether the Welsh Government's spending on climate change "will have any material impact on the climate". The party says it will axe the £73 million Welsh government budget for climate change projects. "We do not consider it to be affordable in light of other budgetary demands," the party says, adding £5m-£10m would be redistributed to the Severn Bridges. Cut "excessive" allowances for councillors and slash "outrageous pay deals"
Ensure mergers are the result of "bottom-up" decisions rather than "top-down" imposition by the Welsh Government. Some reduction in council numbers "may be appropriate" but UKIP opposes Labour's eight or nine authority model. UKIP would support the integration of fire and rescue services with ambulance response, with fire personnel trained as paramedics. The manifesto points to France - where such a system is in place and which the party says is among the best in the world. "This eases the burden on conventional ambulance services, while giving fire professionals an important role during otherwise quiet periods," the manifesto explains. Advocate access to paperwork in the language of your choice, "rather than placing over-emphasis on bi-lingual documents"